Getting an auto loan after bankruptcy is a challenge because you have proved to be un-creditworthy. Most lenders will turn away from offering you a large loan out of fear you will default. You will need to work harder in order to get financing for a new or used car in the future. You will find the same lenders you used before unlikely to loan to you again. Essentially, you are starting from scratch, but this time you have a bad history instead of no history at all. Most states do not allow a bankruptcy to go off a credit report until at least 5 years, and sometimes 10. Even though this may be too long to wait, waiting a little while can be helpful. When you approach bankruptcy, you will have several missed payments reported on your credit score. These payments go 30, 60 or 90 days late, dropping your score each time they are reported. These little problems will disappear after two years in most states. This means, though your credit score will still be low, but it will be slightly higher than right after the bankruptcy occurred. Lenders, particularly car dealers who arrange financing, have a hard time walking away from an immediate, lump sum payment. The higher your down payment, the more enticing your loan will be to a lending agent. Most lenders like to see at least 10% down on an auto loan plus the value of a trade in. In a post-bankruptcy situation, you will not likely have a trade-in to present. Instead, you will have to provide about 30% down in order to be considered for a loan. Borrowers who can put 50% down will almost guarantee financing from at least an alternative lender. Lenders are less willing to issue long-term loans to post-bankruptcy borrowers. The longer a loan goes on, the greater the chance the borrower will get back into financial trouble. If your finances are together right at the moment you seek the loan, the lender has no assurance they will stay that way in the long run. The lender will want to get you to sign a short term loan to mitigate this risk. Short term loans require very high monthly payments, and you will not be able to afford these unless you have budgeted and scheduled correctly. Shopping for auto loans from car dealers gives you a slight advantage. 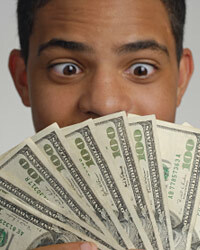 A dealer has an incentive to lend you the money: he or she wants to sell the car. This is particularly true if the dealer is having a hard time making his or her numbers for a given month or year. It is best to shop at the end of the month and at the end of the year. The dealer will want to boost that month's profits; at the end of the year, the dealer will want to get rid of outdated inventory. A dealer may extend a riskier loan in this case.